Egypt's President Abdel Fattah al-Sisi addresses the General Assembly at UN headquarters on September 19, 2017. Egypt's President Abdel Fattah al-Sisi on Tuesday urged Palestinians to unite and "be ready to co-exist" in peace with Israelis, in his address to the United Nations. Speaking a day after a first meeting with Israeli Prime Minister Benjamin Netanyahu, Sisi said an Israeli-Palestinian peace deal was a "necessary precondition for the entire region" to enjoy stability. Egypt has been leading mediation efforts between Palestinian arch-rivals Fatah and Hamas as part of a push to return to the forefront of Middle East diplomacy. 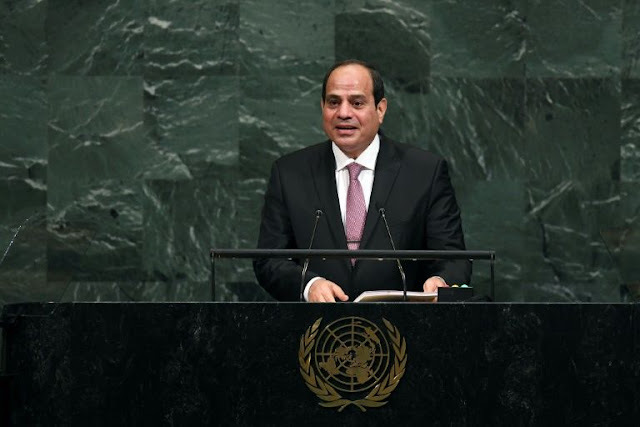 Departing from his prepared remarks to the UN General Assembly, Sisi said he wanted to "tell the Palestinian people, it is important to unite ... to overcome the differences and to be ready to accept co-existence with the other, with Israelis, in safety and security." The Egyptian leader made a similar appeal to Israelis, saying that decades of Israeli-Egyptian peace could be expanded to the Palestinians to "overcome the barrier of hatred forever." "We can repeat this experience, this excellent step once again, together with the peace and security of the Palestinian citizens," he said. Egypt, which signed a peace treaty with Israel in 1979, has called for steps to kick-start Israeli-Palestinian talks that have been comatose since 2014. In his address, Netanyahu said Israel was committed to achieving peace with all Arab countries and with the Palestinians, but he did not elaborate on how this could be achieved. Sisi said "an independent Palestinian state" with east Jerusalem as its capital is "a necessary precondition for the entire region to transit into a new phase of stability and development." An Israeli-Palestinian peace deal would eliminate "one of the main excuses" used by terrorists in the region, he argued. Turning to the United States where President Donald Trump has said he is pushing for negotiations, Sisi declared that there was an "opportunity to write a new page in history to achieve peace in this region." The meeting between Sisi and Netanyahu in New York on Monday followed a rare phone conversation between Palestinian leader Mahmud Abbas of Fatah and Hamas chief Ismail Haniya. Egypt has been mediating between Abbas' internationally recognised Palestinian Authority located in the West Bank and Hamas, which has controled the Gaza Strip since 2007. After Haniya met Egyptian officials in Cairo last week, Hamas announced it agreed to demands by Fatah to dissolve what is seen as a rival administration in Gaza, while saying it was ready for elections and negotiations to form a unity government.